It’s been a couple of months since we’ve done a new product round-up, so a few of these are not so new, but they’re all worth checking out! 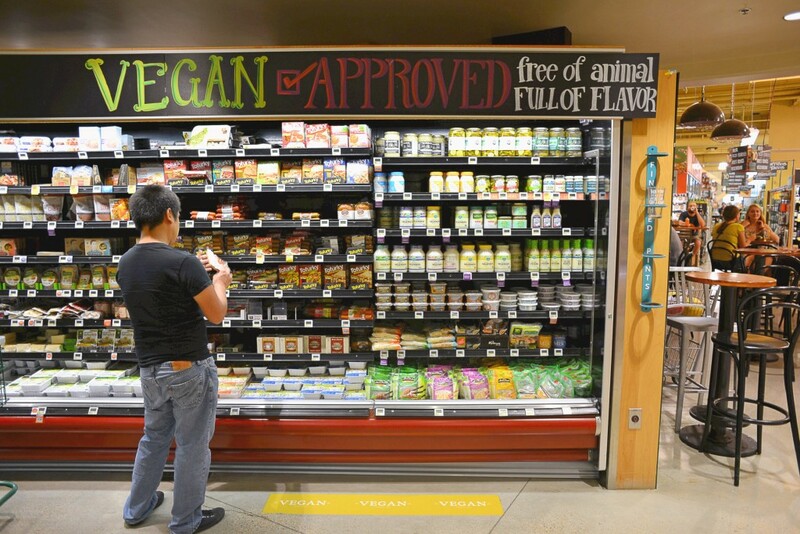 We scoured the shelves of Whole Foods, Wheatsville Co-op, Central Market, HEB and Rabbit Food Grocery to find vegan products that we hadn’t tried before – so many of them are keepers! We’ve got vegan ranch chips, crème-filled chocolate bars, cheddar squares, maple breakfast sausages, mini vegan bottles of wine, boxed mac and cheese and so much more! 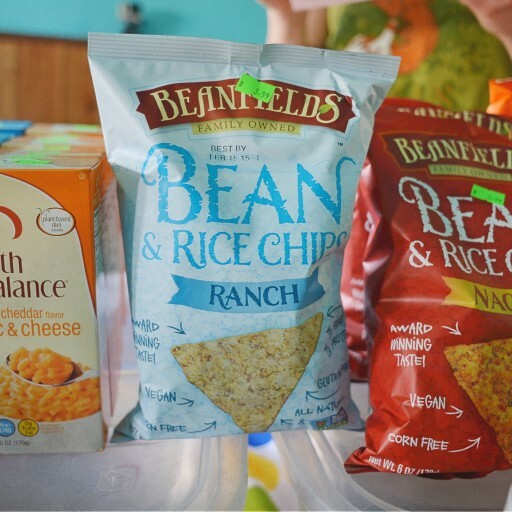 The newest flavor from Beanfields is now available from Rabbit Food Grocery. It's tangy and herby, and oh so reminiscent of my childhood favorite chips. Ranch fans, rejoice! 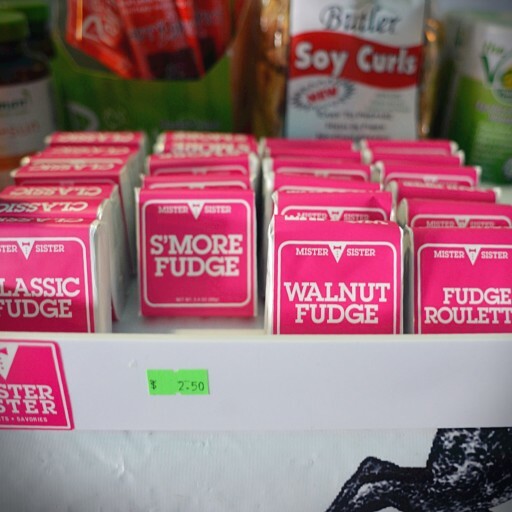 Available in classic, s'more, walnut and roulette (rotating flavors), this all organic, ethically sourced vegan fudge is super rich and yummy. 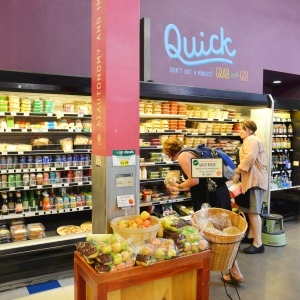 Pick a package up from Rabbit Food Grocery! 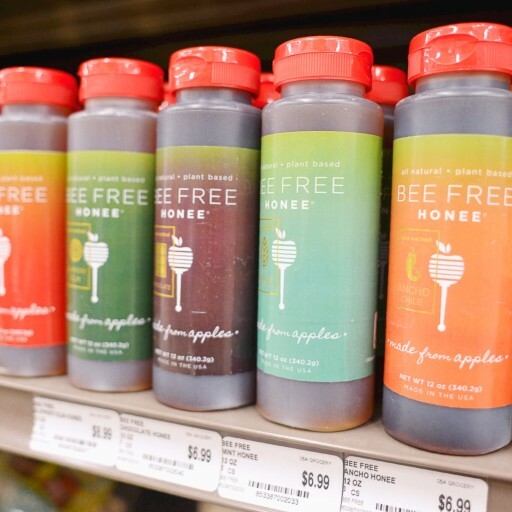 Bee Free Honee is now available in a wide variety of flavors including ancho chili, mint, chocolate and slippery elm. Check them out at Rabbit Food Grocery and Wheatsville. 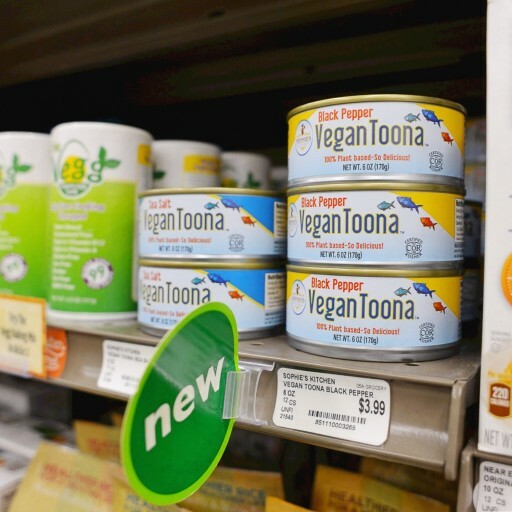 Sophie's Kitchen has come out with a canned vegan toona, available in two flavors. The sea salt flavor is pea protein based and is soy-free, and the black pepper style is TVP based and has soy. We mixed the black pepper one up in a tuna salad, and made a decent tuna melt out of it. The smell and presentation is pretty fishy, so it's worth a try if you really miss canned tuna. Magic Vegan Bacon Grease is something I never knew I ever wanted, but Southern cooks clued me into its magical properties. It's basically smokey coconut oil with bac'n bits - great for making southern style collards and biscuits. I mostly used it to fry up Upton's Bacon Seitan. Wheatsville and Rabbit Food Grocery carry it, though it's unfortunately currently out of stock at both. These have been on the market long enough that they're not constantly sold out - which is dangerous, as we've been in the habit of grabbing a box whenever we can find them. They're cheesy, salty and super addicting. 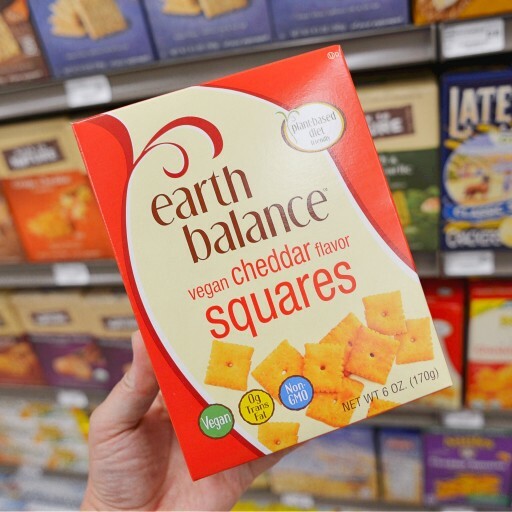 Former Cheez-Its fans can get their fix at Rabbit Food Grocery and Wheatsville. 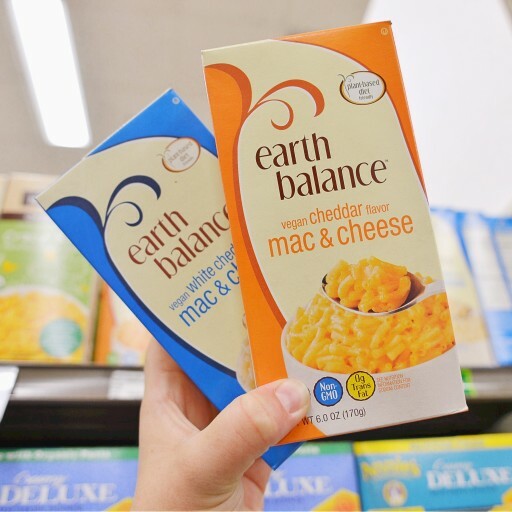 Earth Balance has been killing it with white cheddar popcorn, cheddar squares, and now boxed mac & cheese! In regular and white cheddar flavors, this boxed mac and cheese might be the cure for your blue box blues. Pick it up at Rabbit Food Grocery and Wheatsville. 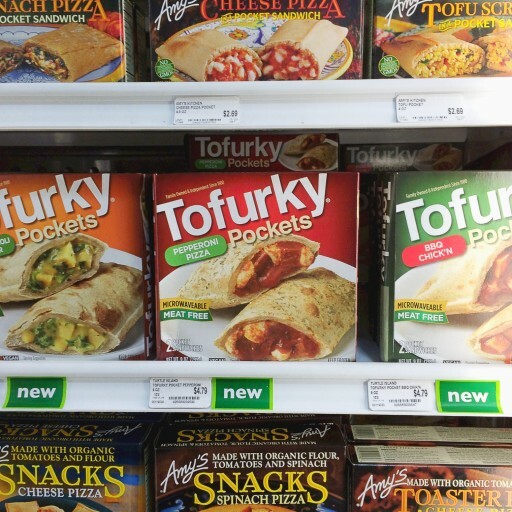 These frozen pockets are a fun freezer find, in turk'y broccoli and cheddar, pepperoni pizza, and BBQ chik'n flavors. The pepperoni pizza is our current favorite. There's also a delicious sausage and veggie quiche (not pictured) that arrived on the shelves around the same time. They've been around for a few months, but if you haven't tried them yet, be sure to pick some up at Rabbit Food Grocery or Wheatsville. This line of organic wines is vegan friendly (it even says so on the label! ), and best of all, it's available in cute little single-serve bottles! Just enough for a glass, with a little left over to cook with. 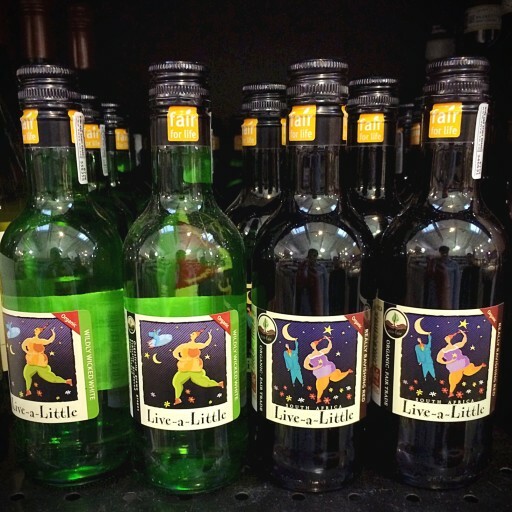 Miniature and full-size bottles in white and red are available at Wheatsville Coop. 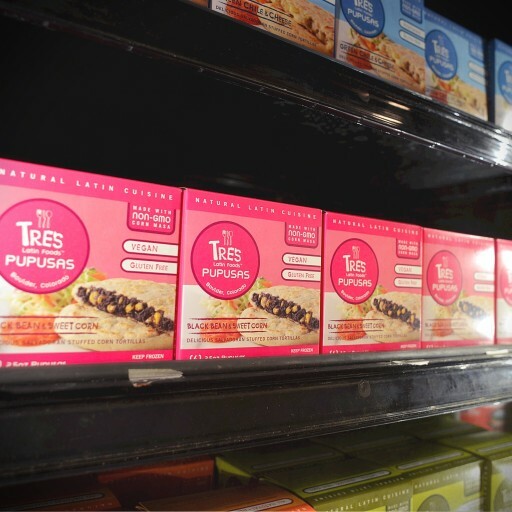 These vegan and gluten-free frozen pupusas from Tres Pupusas are super convenient and filling! We enjoyed ours topped with sliced avocado. Get yours at Wheatsville Coop. These juicy seitan burgers made with barley, fresh carrots, and celery can now be yours at Whole Foods. The flavors were reminiscent of meatloaf, so we found that it pairs best with classic burger toppings. 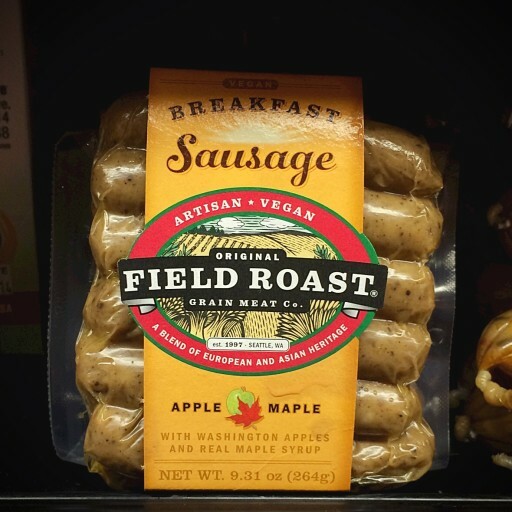 Field Roast can really do no wrong in my mind, but they really knocked it out of the park with these apple maple breakfast sausages. They are now a weekend breakfast staple in our house. You can find these at Whole Foods when they're not already sold out. 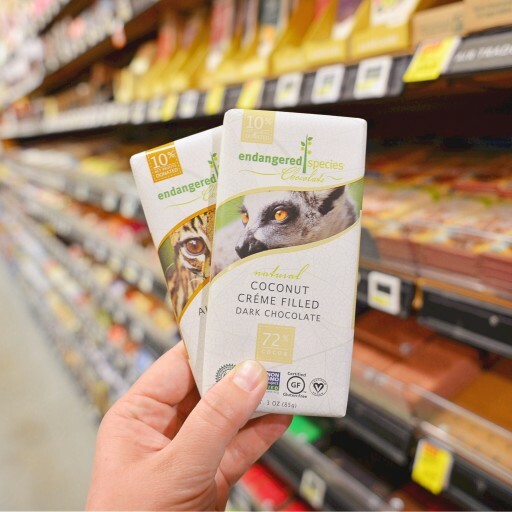 These milk-free chocolate bars come packed with a smooth, creamy filling in flavors like lavender mint, lime sea salt and blueberry vanilla. We've found most of the flavors at Wheatsville Coop and Whole Foods, with some showing up at HEB as well. We found out about GoodBelly when we were searching for a vegan probiotic. 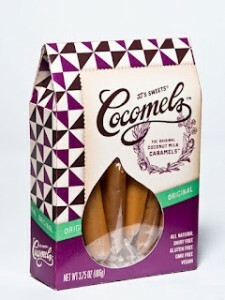 GoodBelly won us over when we learned that their entire product line-up is vegan (with many flavors gluten-free as well). 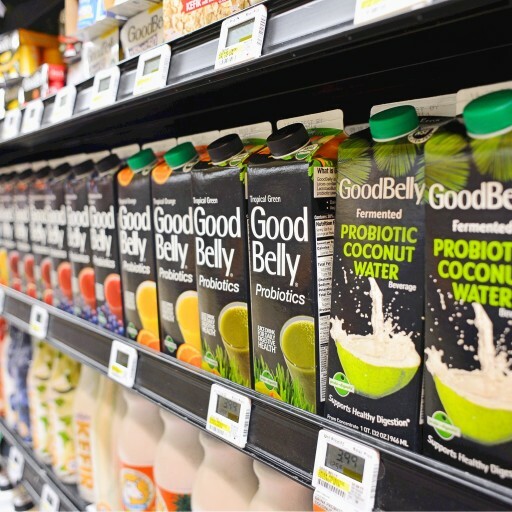 We use GoodBelly juice daily as the base for our smoothies, so we were excited to see their whole line-up of flavors at Whole Foods, including this new probiotic coconut water. 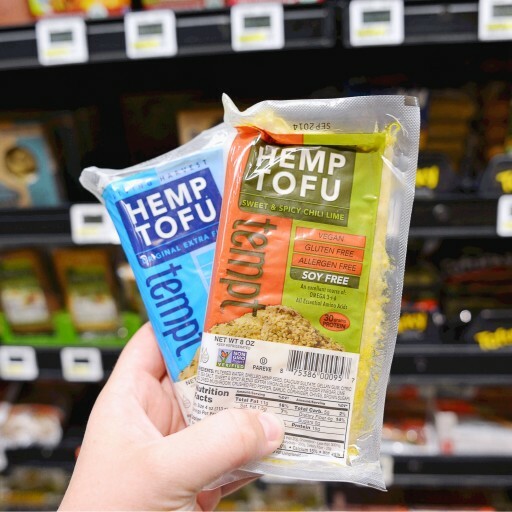 Great for anybody on a low-soy or soy-free diet, this protein-packed hemp tofu is available in plain or chili lime flavors at Whole Foods. 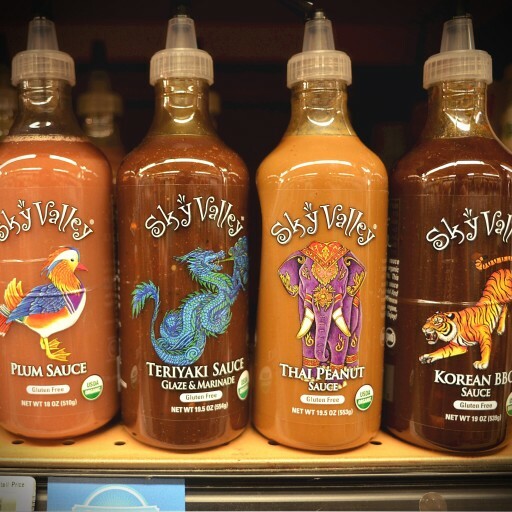 You may be familiar with Sky Valley's organic sriracha sauce, but did you know that they recently expanded their lineup of organic Asian-inspired sauces? With vegan versions of plum sauce, teriyaki sauce, Thai peanut and Korean BBQ sauce, you can easily add flair (insert jazz hands) to your dishes. 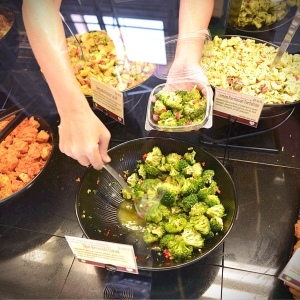 Take your pick at Whole Foods. This hickory-smoked bacon cooks up to a crisp, and even comes packed with enough grease that you won't need to oil your cooking surface (like the real deal). 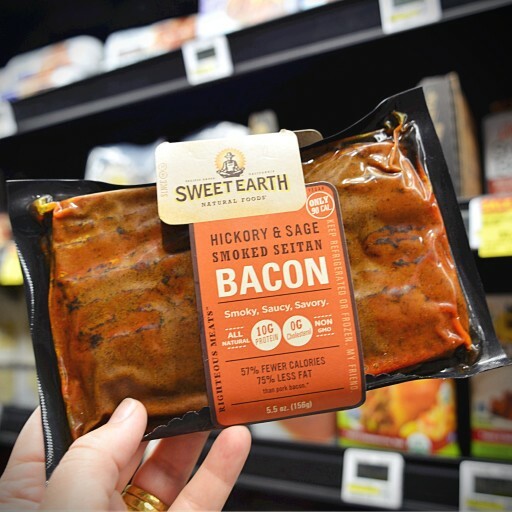 Sweet Earth also makes a bunch of packaged seitan and burgers that seemed to spring up overnight. 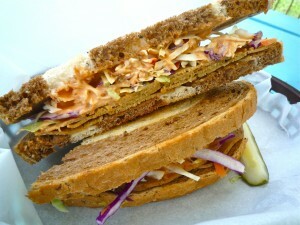 The seitan bacon can be found at Whole Foods, but other Sweet Earth seitan products have been spotted at HEB as well. 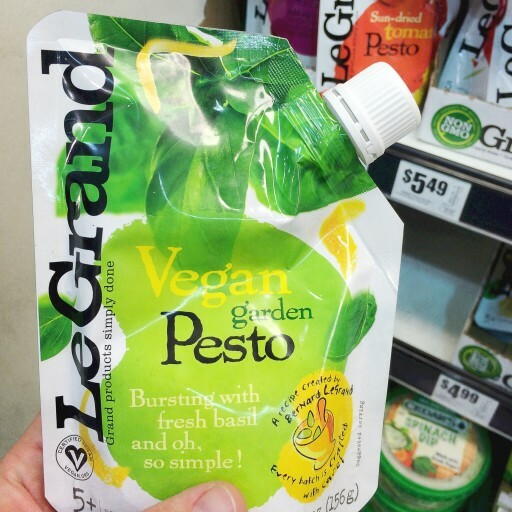 I noticed Le Grand pesto on the shelves a while ago, but recently they switched up their packaging to boldly display its vegan-ness, so I thought it deserved a mention. It's a traditional pesto (sans cheese), and is super conveniently packaged in a squeezable and resealable packet. Easy to add to sandwiches, pastas, soups - you name it. We go through this stuff really quickly. Find it in the refrigerated section at Central Market. 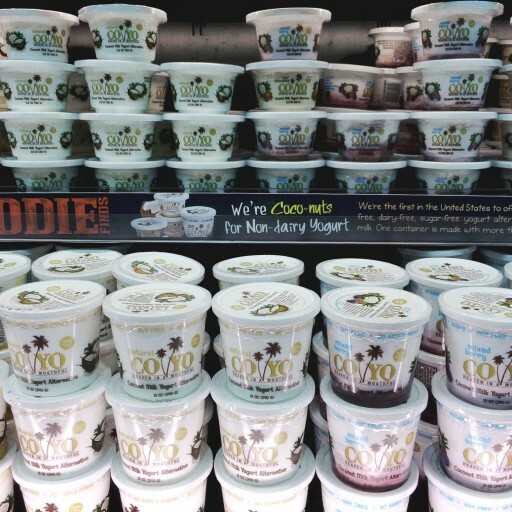 Our friends Down Under have been snacking on this yogurt made from pure coconut cream for some time now, and now it's available in the US. 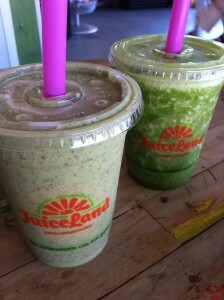 We had a chance to try it while traveling in New Zealand, and were surprised by how rich it is. It's pretty much just pure coconut cream with yogurt cultures, so many people might prefer to mix it with granola or additional fruit. We picked up several flavors at Central Market, and plan on whipping them up to add to a fruity parfait. 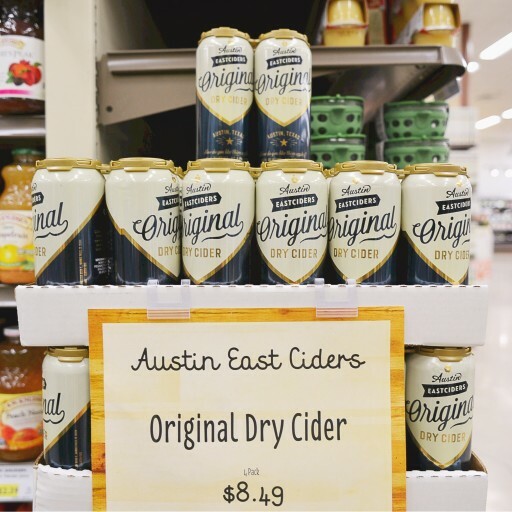 Austin has its fair share of local craft beer, but did you know we now have our own craft cider? Unlike many ciders in the US, this cider is dry and light, and perfect for summer. This local cider's original flavor is vegan, and can be found at Counter Culture, Wheatsville, Whole Foods, and Hyde Park Market (aka The Flag Store). Let us know what you think of these products, or if we’ve missed a new product you love! Also, if you’ve seen any of these on the shelves of a store we didn’t list, give us a heads up, and we’ll update our post. Happy Eating! Popcorn Tofu from Wheatsville Food Co-op is the best! 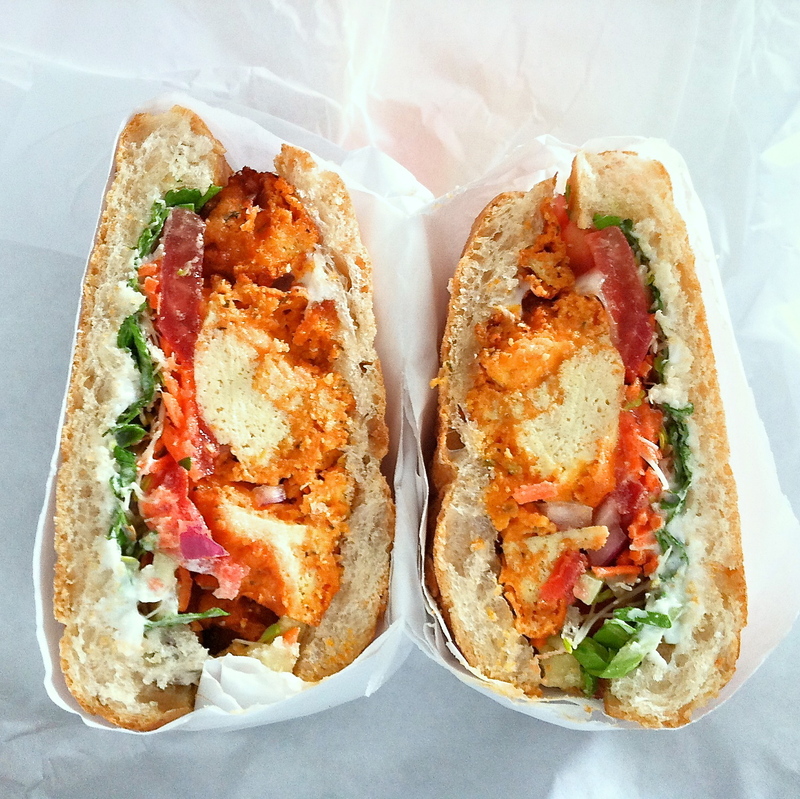 Particularly the Buffalo Popcorn Tofu, and more specifically the Buffalo Popcorn Hoagie (sub ciabatta*) from the deli counter. Popcorn Tofu is the stuff of legends, and the Buffalo Popcorn sandwich lives up to its reputation, stuffed to the gills with Buffalo Popcorn Tofu, vegan blue cheeze dressing, sliced tomatoes, lettuce, red onion, carrots, jalapeños and alfalfa sprouts. 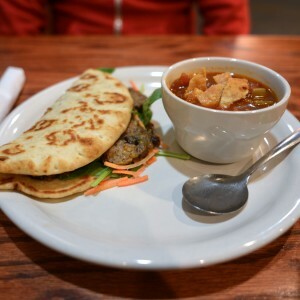 If you’re not into spicy food, order it without the jalapeños, or play it even safer and get the Popcorn Tofu Po’boy (also sub ciabatta, and sans jalapeños). Want more Buffalo Popcorn Tofu in your life? 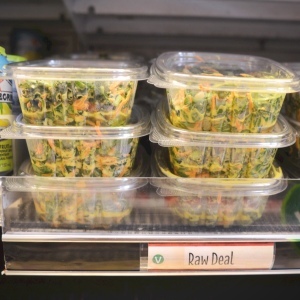 Buy it by the tubful from the deli counter, or pick it up in the cold case. You can even grab it on a ready-to-bake pizza. 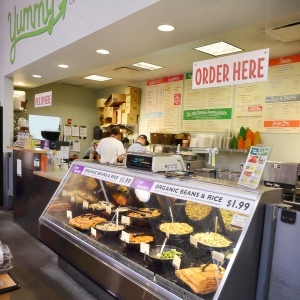 When you want to switch things up, try Wheatsville’s always vegan-friendly, and always delicious hot bar. 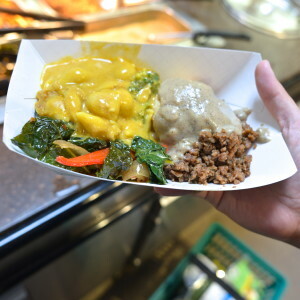 My favorite hot bar combo is on Sundays, when they break out the biscuits and gravy, vegan sausage crumbles, spicy greens and the other Wheatsville fave – mac and cheeze (also available during the week, as well as in the cold case). Wheatsville will soon have two locations where you can get your Popcorn Tofu/hot bar fix. 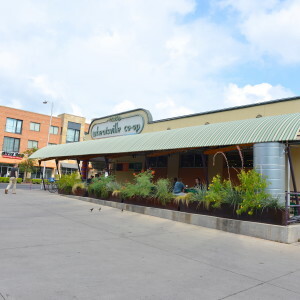 We have our tried and true north location on Guadalupe, but South Austinites have a very exciting second location coming at ‘em any day now. Yay for more Popcorn Tofu in this world! * Why sub ciabatta you may ask? Well, as you can see from the pictures above (top is ciabatta, below is hoagie), you get the same ingredients either way, it’s just how you prefer them to be distributed. 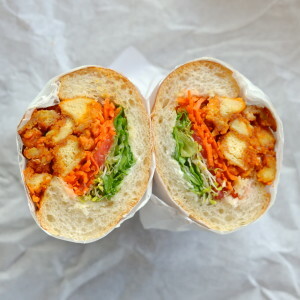 If you like to eat your sandwich like a burrito, where each bite comes with a different ingredient, then go for the hoagie, but if you’d rather eat your sandwich like a sandwich, and taste the combinations of flavors and textures with each bite, go for the ciabatta. Obviously I have my preference, but it really is great either way! – Upton’s Naturals Bacon Seitan has been spotted at Wheatsville Coop! Some of you may remember my post about this product published over a year ago, begging for this product to hit shelves, and now it has! 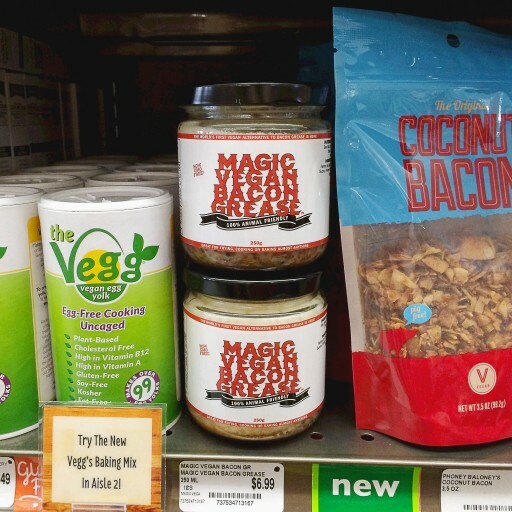 There’s a bevy of fakin’ bacon products out there from coconut bacon, to grain bacon, to tempeh bacon, but no one has made a commercial seitan bacon until now. I can’t wait to make BLTs and benedicts with it! 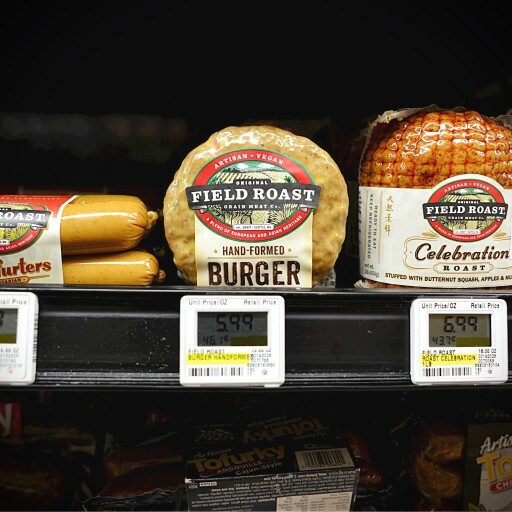 – Beyond Meat is finally here as well! Technically, it’s been here for a few weeks, so you’ve probably seen it on the shelves at stores around town, but I know that both Rabbit Food Grocery and Wheatsville definitely have it in stock! 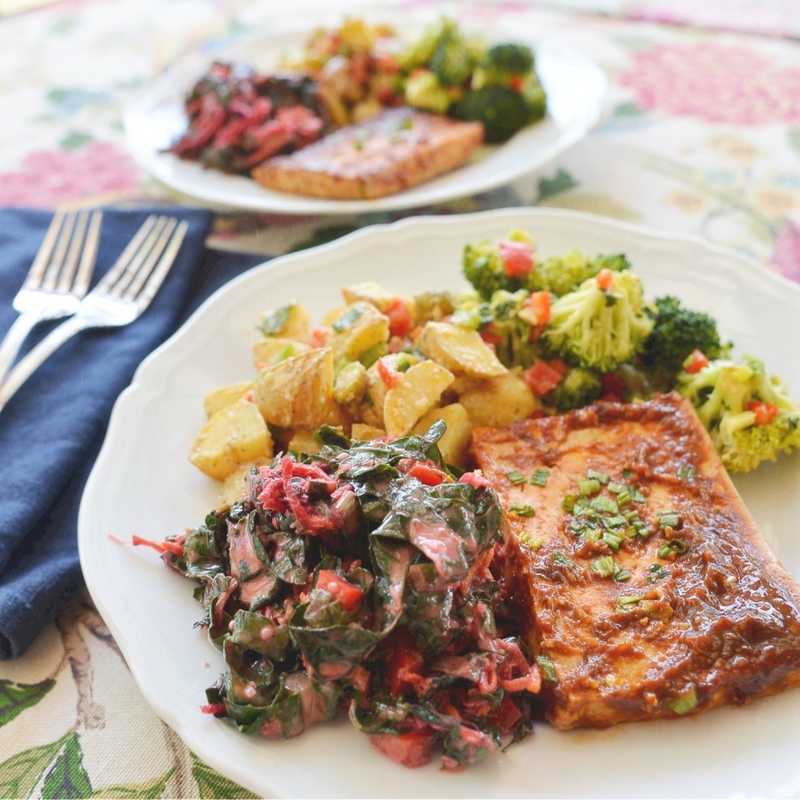 – Sophie’s Kitchen’s lineup of vegan seafood products just keeps getting bigger and bigger! 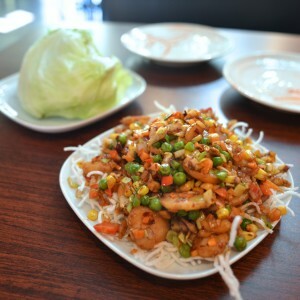 I spotted coconut shrimp and fish sticks at Wheatsville the other day, right alongside their vegan crab cakes, fish filets, calamari and prawns. Is there a seafood product they can’t make out of konjac? 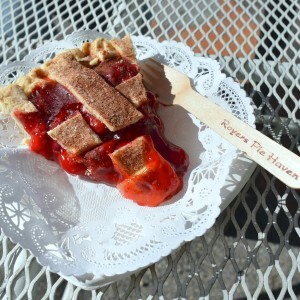 – Have you had a chance to check out the adorable little East side bakery Sugar Circus yet? 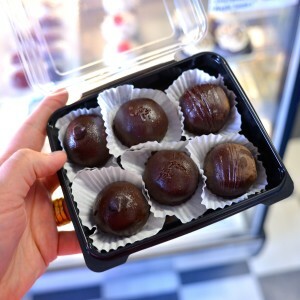 Well if you haven’t, this is the perfect excuse: vegan cake balls! These little moist marvels come in three vegan flavors: double chocolate, vanilla chocolate and cookie dough. 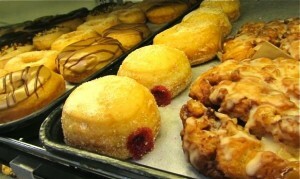 Eat one or eat a dozen, it’s up to you! – My favorite local tempeh company and my favorite local Indonesian restaurant have teamed up to bring you tons of tasty tempeh creations! 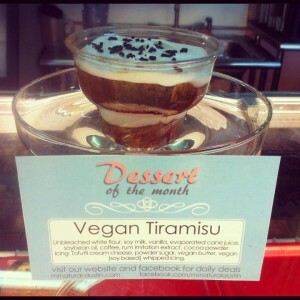 Head on over to Java Noodles on E Oltorf, and add organic tempeh from The Hearty Vegan to any dish! – We’ve got not one, but two vegan ramen options up in this town! 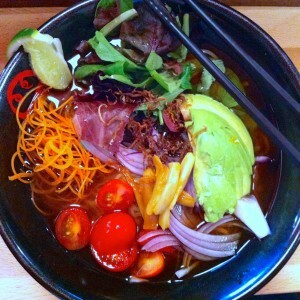 I reviewed the ramen at Ramen Tatsu-Ya last week, so I thought I should stop by Daruma Ramen to compare. The two ramens couldn’t have been more different. From what I can gather from people who know more about ramen than I do, Ramen Tatsu-Ya’s vegan ramen is a more traditional take, while Daruma Ramen tries to do something a little different with a sweet potato broth and salad toppings. If you have a chance to check out both, let me know what you think. 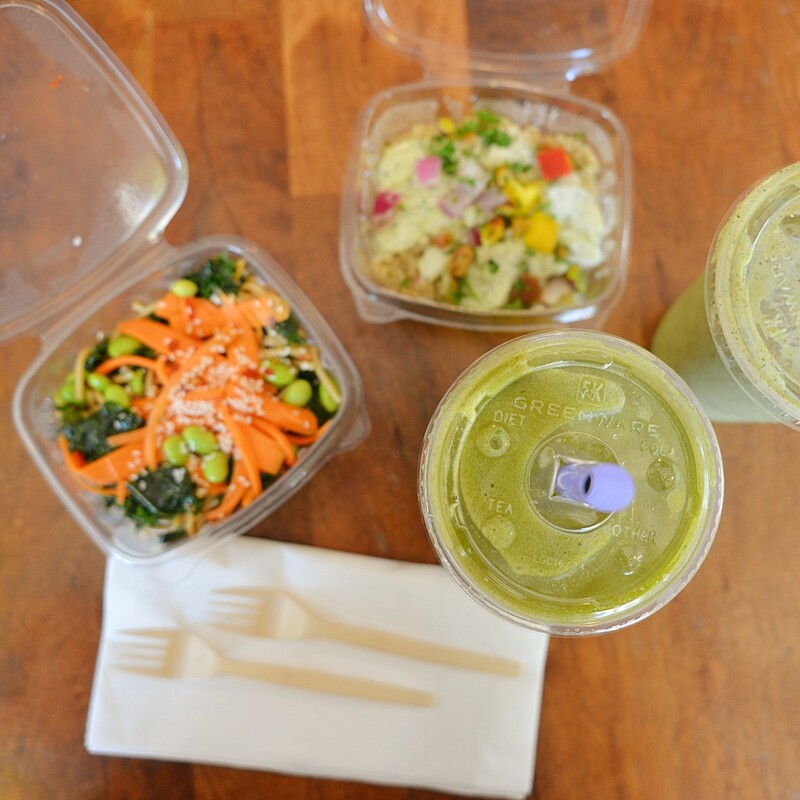 – The Daily Juice in Hyde Park is now a Juiceland, and while I’m super sad that they got rid of all the awesome menu items like the nachos, I’m super happy with the new items in the salad case. 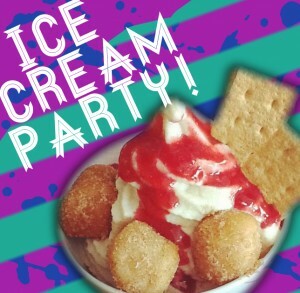 I hope I see more food options from them in the future, cuz sometimes it’s nice to grab a meal to go with my ice cream. 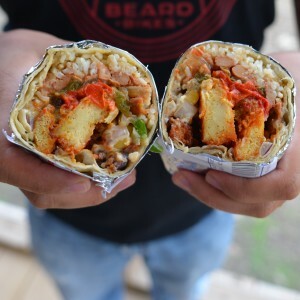 – You may have seen them at Texas VegFest, but did you know that Unity Vegan Kitchen is planning on opening up a vegan food trailer sometime this summer? 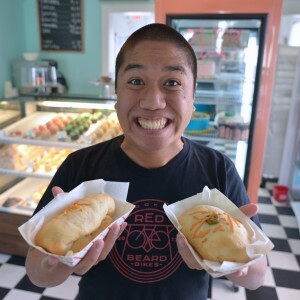 After trying their vegan cannoli at VegFest, I for one, am very excited to see what they plan on bringing to the Austin vegan scene. – Free this Saturday, April 20th? Why not head on over to the annual Gathering of the Tribes at Pease Park? It’s a large vegan potluck that gathers a good chunk of the different Austin veg groups together in one place. It’s the perfect opportunity to meet some new friends! 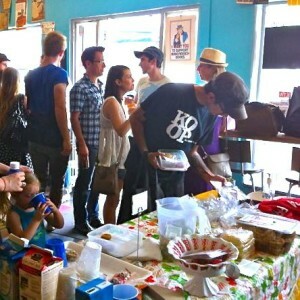 – The 2013 World Wide Vegan Bake Sale in Austin is going to be held on Sunday, April 28th at not one, but two locations! 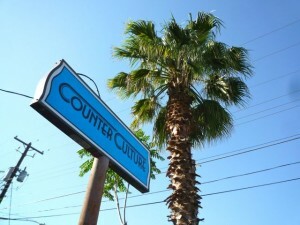 Sign up to bake something here, then head over to MonkeyWrench Books or Counter Culture to drop off your goods. The money raised will go towards helping the animals at Sunny Day Farms! 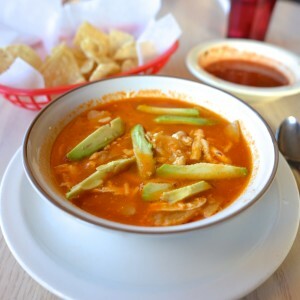 – ATX Vegan Drinks goes south of the border next month with a special “Drinko de Mayo” event at the Vegan Nom on Friday, May 3rd! Come join us for piñata smashing, food specials, music, and BYOB fun. - ForAnima.com is a new all-vegan online marketplace. With food, beauty, clothing and home goods all in one place, you can conveniently browse for new and exciting vegan products. They have a blog, recipe, service directory and community section of their website too, so you get a little bit of everything, all from one site. - Vegan Food is Everywhere is an interesting new food mapping website that shows, in a very visual way, that in fact, vegan food is everywhere. The Austin section is lacking, though, so if you have some free time, get on there and let the world know how much awesome food we offer!